Last week, I talked about things in Japanese food culture that taste like nothing. Coincidentally, I found the quintessential food that tastes like nothing - shirataki noodles made from konnyaku. The Japanese version of these are usually translucent and look like deep sea creatures spindly body parts or particularly disturbing worms. I had them a few times in stews when I lived in Japan and I found them creepy and disgusting both in texture and appearance. 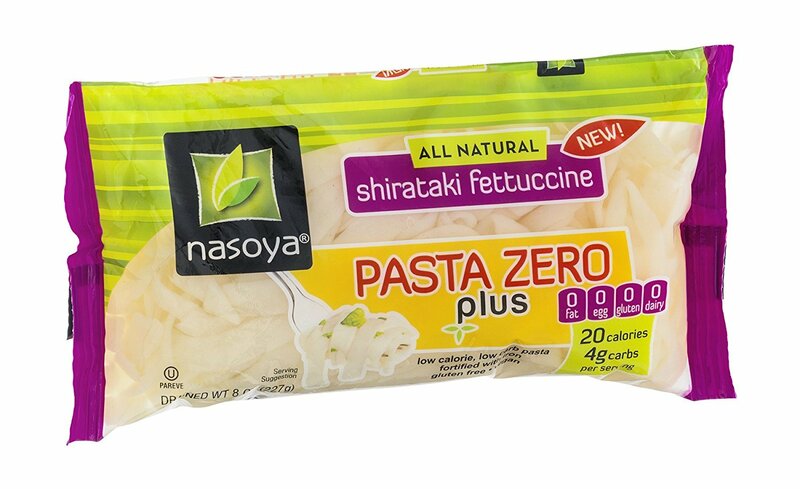 However, these noodles are what many Americans have often pined for; they are a food with almost zero calories. Of course, most people who want to eat as much as they want without the pain of gaining weight are thinking about zero-calorie pizza or chocolate, not flavor-free noodles sold in a stinky briny solution that you have to drain and rinse off. 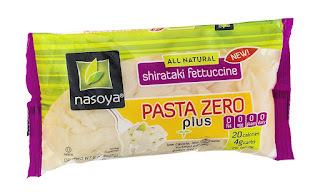 This particular brand by Nasoya isn't the only variety out there, but I believe they are all sold in the refrigerated section of stores in bags of fluid. If you read the reviews for the product (and others like it) on Amazon, there are lots of complaints about the indescribably bad odor that comes off of them when you release them from their watery prison. If you go to the Amazon link, you'll also see that they sell for about $56 for a case of 12. That's $4.66 per bag for something which includes just two servings of noodles. It's a very steep price for something which is a component of a meal and not a meal unto itself. The reason that this is a "surprise find" for me is not only my (as mentioned in previous posts) rural isolation and limited grocery store options, but the price I paid for these. I found these at the local Grocery Outlet for 37 cents a bag. Unlike the ginger rice crackers that I got for 50 cents, I did not lose my head and buy 24 of these. One reason was that there were only five bags in stock. Another was that I'd never tried these before and their expiration date was within four days of my purchase. Still, I bought three bags because, how bad could they be? The answer to that question is, "It depends on how you prepare them." My first two runs with the first bag were between so-so and not-so-good. My final one, in which I took my recently expired noodles from the last two bags and just tossed it all into one big dish, worked much, much better. I should note that these are more troublesome than conventional pasta in some ways. First, you do have to drain them and rinse them well and the fluid inside carries a bouquet that will wilt any nearby foliage. I recommend just holding your nose and doing a fast dump and rinse. It doesn't last long. It's like getting a shot at the doctor. A short amount of unpleasantness then it's all over. After you rinse and drain them, you need to boil them for 1-2 minutes. I actually tasted a noodle right out of the rinse (not right out of the bag, I'm not crazy or masochistic) and it seemed perfectly cooked and fine. I think the instructions to boil them is make sure you get all of the brine off and to get them hot so they dry out better. After the quick boil, you dry fry them in a pan to get them a bit drier. I used olive oil the second time for this and just cooking spray the first time. The purpose with this isn't to toast or cook the noodles, but to get them drier and less translucent. This is supposed to improve the texture so they're more like conventional pasta. With my first two attempts, I took the pasta and just mixed other things in with it. The first was a butternut squash soup and freshly grated Parmesan cheese. This was okay, but not great. I felt the noodles texture a bit too keenly and they were super stretchy and a bit chewy compared to traditional pasta. The second time, I mixed in cheeses (cream chesse, Parmesan, mozzarella) and that was the worst. I also learned that these fettucine noodles seem to be designed for someone who prefers to spend more of the meal time twirling a fork than eating as they are miles long. In fact, if the scene in "Lady and the Tramp" were to be redone with these noodles, it'd take them about a year to eat up the noodle enough to meet in the middle. I vowed to cut them apart next time I ate them (and I took kitchen scissors to them as planned - I recommend this step). These noodles really need a sauce to give them flavor. For my final preparation, I went all out and sauteed onions, garlic, bell pepper, mushrooms, and (hydrated and flavored) TVP in olive oil then added a jarred creamy tomato and roasted garlic sauce. I added the dry-fried noodles to this and it was indistinguishable from regular pasta. The main benefits of this besides the super low calories and low carb count is that they are loaded with fiber. The main downside is that they aren't as versatile as regular pasta as they need something else to take on the flavor of. You couldn't just toss these in olive oil and Parmesan cheese to create a side dish. The biggest demerit though is that they are usually quite expensive. Nearly every vendor you can mail order these from sells them for $2.50 a bag (often much more) and you need to buy large amounts at once. In terms of how I feel about these, I think that it's hard to get too excited about noodles in general, but I'd buy them again in a heartbeat provided that I could get a bargain on them (a dollar or less per bag). This would not be for any reason other than the fact that these are supremely healthy. While I wouldn't expect to get them for 37 cents a bag again, I'd probably pay as much as $2 each if I were in the serious mood for pasta, which I will admit is not very often for me as I'm not much of a noodle person. If you're on a special diet (low-carb, Keto, whatever) though, these can be quite a Godsend to vary your mundane eating options. I imagine the extra effort and the unpleasant odors associated with the noodles would be something that one could develop a tolerance for after a few weeks of eating mostly meat, cheese, non-starchy vegetables, and avocados.